My next concept burger experiment of the summer is inspired by the cuban sandwich consisting of roast pork, ham, swiss cheese, pickles, mustard and/or mayonnaise. Given that the primary meat in the sandwich was pork, using ground pork to form the patties only seemed natural. Very often the roast post for the cubano sandwich is seasoned with mojo so and I included some of the flavour elements from mojo seasoning in the burgers including garlic, cilantro, lime, oregano and cumin. With that the cuban burgers were pretty much done. One of the things that I like so much about burgers is that it is pretty much as easy as mixing a few ingredients into the ground meat, forming patties and then throwing them on the grill for a few minutes. Another thing that is nice about burgers is that even though you can make the patty itself super tasty like this one, you don’t need to stop there as you can continue on and fill the bun with even more flavours. In this case I added the sliced deli ham along with some melted swiss cheese, the pickles and some mustard. I added one final, not so secret ingredient, a roasted garlic mayo that I had made for the side that I served with the burgers and it really took them over the edge adding to an already amazing flavour combination! Mix the garlic, cilantro, lime zest, oregano, cumin, salt and pepper into the pork. Form the pork into 4 patties about 3/4 of an inch thick. Grill (or broil or pan fry) the burgers until cooked, about 3-5 minutes per side. Mix the roasted garlic and into the mayonnaise. These look amazing! I plan on trying them very very soon. Such a good idea! You are so creative! These look so flavorful. Oh boy, those look great. I love the idea of adding more meat as a burger topping! Such a clever burger/sandwich hybrid concept! the burger looks so salivating! that`s really interesting recipe! and looks so yummy! 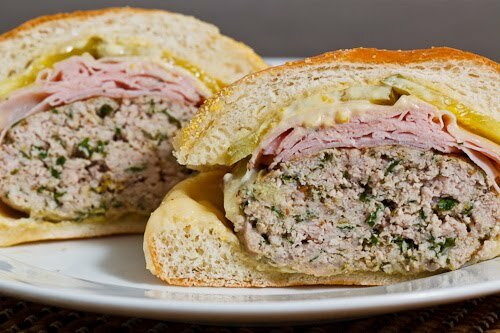 Given my adoration for Cuban sandwiches…these burgers are screaming MAKE ME! Goodness gracious! This burger looks absolutely amazing! I was surprised that you were able to find ground pork – is this something you ground on your own? Am I crazy? Because I just don't remember ever seeing ground pork (unless it is a sausage) in my grocery store. Would the butcher do this for me? Thank you! Genius! I love Cuban sandwiches. Never thought of this, great idea, thanks for sharing! oooh love how thick these burgers are!!! they look awesome! Now that's one fantastic looking burger! As a Cuban sandwich aficionado, Ima hafta make these! Yum! I think you've outdone yourself Kevin! Beautiful burger and totally unique! Patty: If you cannot get the ground pork at your grocery store I am sure the local butcher would make some for you. I guess I am lucky in that most of the local grocery stores carry it and the local butchers have it all the time. Kevin I just discovered your blog (I was looking for a good picture of Nutella crepes!) and it is AWESOME! Thanks for sharing your recipes with us, you are amazing!! Wow! Gorgeus!! I must give this a try this weekend! Thank you for sharing such interesting recipes!! That is a great looking burger! Can't wait to taste it myself. Just discovered your blog and am enjoying going through the archive. I love that you do all original recipes and the photography is great, plus it is not dessert-oriented, which so many blogs are. Yours really makes me want to branch out and try some different ethnic cuisines. A question: what would you suggest I use in place of harissa, which is not something our local stores carry here in small town ND. My daughter has had a reaction to spicy Chinese food in the past and we haven't pinpointed the exact spice that caused it, so I mainly stick with red peppers and red pepper flakes, which are safe for her. Do you think that would be a suitable substitution? I'm specifically looking at the Moroccan tagine recipe, which I would like to try since those fruits are now available. Thanks! Just one word is necessary…YUM! Great idea…the look like they are loaded with flavor! Burgers is my favorite foods ever. I think I almost tried all kind of burgers. That Cuban burger is so new to me. It looks so juicy and yummy. I need to try that one. I love burgers that have a certain height to them, makes them so much better to be able to sink your teeth into one! OTA Mom: Red peppers and chili flakes would work well as a substitute for harissa. If you wanted to get a little more complex I found this recipe for harissa. Wow, great job here. Awesome picture too! You should really consider submitting this to Recipe4Living's Juiciest Burger Contest! It looks delicious! I made these last night and they turned out fantastic. A cuban sandwich is my tied for my #1 favorite sandwich (muffaleta being the other). I made these burgers a few weekends ago and they were great. I went a little heavier on the lime zest and I also added some grapefruit zest. These burgers were juicy and flavorful. The pickles and mustard are a must to accompany these great burgers. Great recipe. "Cuban Burger" is fantastic, tasty and very healthy too. I randomly found this recipe and gave it a try – DELICIOUS! Thanks so much!